If you are like many homeowners, you stare at your yard in dismay each morning. Your lawn is full of yellow grass that hasn’t grown an inch in weeks. You’ve tried expensive fertilizers and chemicals from the store, but all that they have done is waste your time and your money. You may have even attempted adjusting your yard’s watering schedule, to no avail! It can be maddening to try so many different things to make your grass grow, only to watch them each fail to deliver on their promises. It’s enough to make anyone consider replacing their lawn with rocks! Instead, Lawn Works has a different, more efficient solution than anything you can buy at the store. Core aeration, one of our top lawn care services, is among the best ways to promote sustained lawn growth, all without adding chemicals to your grass. The process is a simple application of our yard aeration machine. By punching small holes throughout your yard, thick clumps of soil get removed. But how does turning up dirt help grass grow? One of the most overlooked aspects of grass and other plants is remembering that they, like all living things, require oxygen. Over time, the soil in your yard grows thick, preventing sufficient airflow to travel to the grass’ root system. As a result, the grass becomes stunted, and it may wind up choking it out entirely. By removing natural clods of dirt, rock, and even tangled roots of other plants and grass, it allows your yard to breathe once more. The process is simple, and we’ll have your yard oxygen-rich in no time at all. The aeration machine works by using a hollow drum, the core, with small puncturing tips along the outside. As it glides across your yard, it’s churning up the thick, stubborn dirt in the process. It’s much like using a manual lawn mower like your parents or grandparents used for their yards. In a short amount of time, your lumps of dirt will have gotten removed, and your yard can finally grow to its full potential! Many homeowners spend a fortune on expensive products and kits from the store. They may even believe that it’s some growth of weeds that are the problem, causing them to try methods that won’t solve the issue. Before too long, they will have wholly poisoned their yard, attempting to kill a threat that was never there at the beginning! By then, you’ve already spent a fortune and have nothing but a dead yard to show for it! 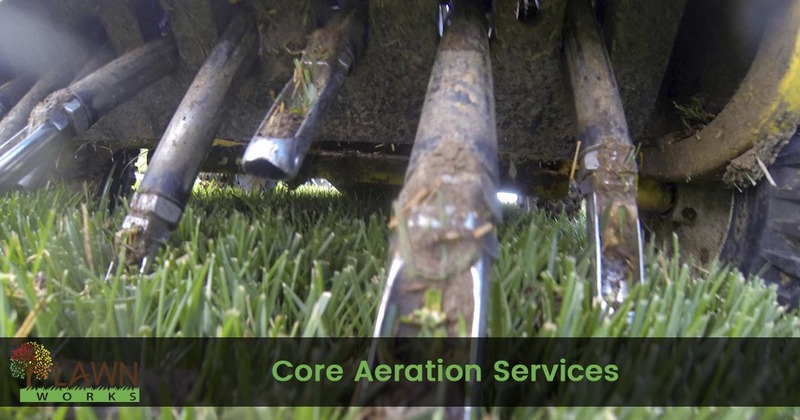 Instead, core aeration requires no added chemicals and is safe to use any time of year. Your yard will only benefit from the process, with no adverse side effects! Call today for the safe, efficient, and faster way to promote healthier growing grass. Your yard will look like new again, all without expensive chemical treatments.